Do it all, but "halara". We've put together a three-day itinerary that hits all the high notes without leaving you beat. Your official “check-in” to the city takes place in its largest, most “European” square, envisioned by French urban planner Ernest Hébrard a century ago as a center of commerce and social life, and a “gateway” to the sea. 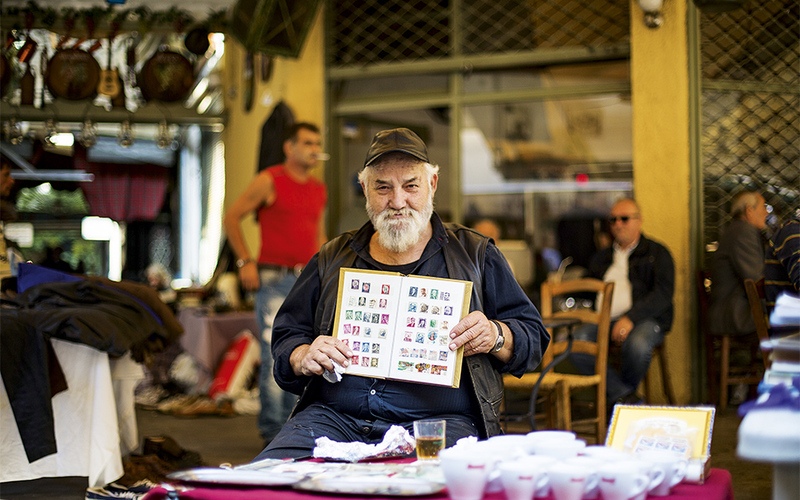 Your first acclimatizing stroll will take in the bustling, outdoor Kapani Market on Menexe Street; Athonos Square, with its traditional tavernas and its herb and spice shops; the Modiano Market (soon to undergo a radical makeover), with its grocery stores and ouzo bars; and Komninon Street, with its bright flower shops. And if fashion is your thing, you’re in the right place: Tsimiski, Mitropoleos and Proxenou Koromila streets have everything, as you can see by the attention-grabbing window displays of Max Mara and Attica Department Store. Hungry? For a perfect city moment, buy a koulouri (a bread ring covered in sesame seeds) from a street vendor in the square and sprinkle some seeds around: the pigeon show will start in seconds. In Thessaloniki, the key word is halara (“take it easy”), a sentiment clearly in evidence at the hundreds of cafés. Have you ever had a coffee in a historic Ottoman-era bathhouse? Some of the best coffee in town is served in unusual places. Have one under the dome of the Aigli Geni Hamam (3 Aghiou Nikolaou), or amid the tiled domes of the rooftop of the Bey Hamam at the café-bar Palio Hamam (11 Mitropolitou Gennadiou). Popular Ypsilon (5 Edessis) is a café, workspace and cultural venue housed in an old traveler’s inn, while the old post office on Tsimiski makes for an interesting setting for Toms (22 Tsimiski). 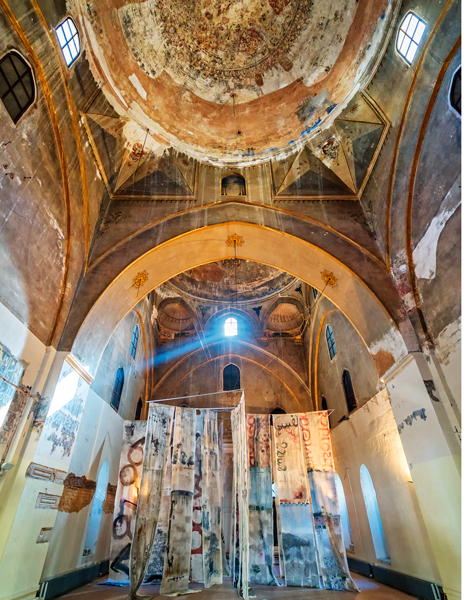 Mob (Ionos Dragoumi & Papadopoulou), which hosts art events, captures the essence of the old commercial neighborhood with original architectural details. 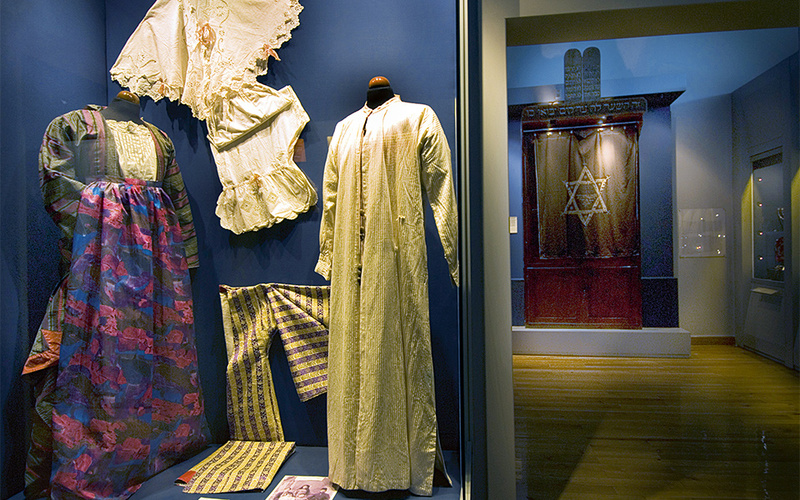 Time to discover some of the city’s rich history, beginning at the Jewish Museum (11 Aghiou Mina), housed in a century-old landmark building. A visit to the hall dedicated to the Holocaust, with objects from the Nazi crematoriums, is a particularly moving experience. The audio tour is recommended; headphones are available at the entrance. Two minutes’ walk from the museum at 6 Edessis, is the Bensousan Han, an early 19th-century inn that once provided lodging for travelling merchants and today hosts cultural events and exhibitions. The restoration of the building has preserved the patina of the past and the atmosphere is eerily evocative; you have the feeling that the former owner – Samuel Bensousan – may step out of the semi-darkness at any moment to welcome you. A 10-minute drive from the city center will take you to the district of Kalamaria, with its relaxed character akin to a seaside vacation town. 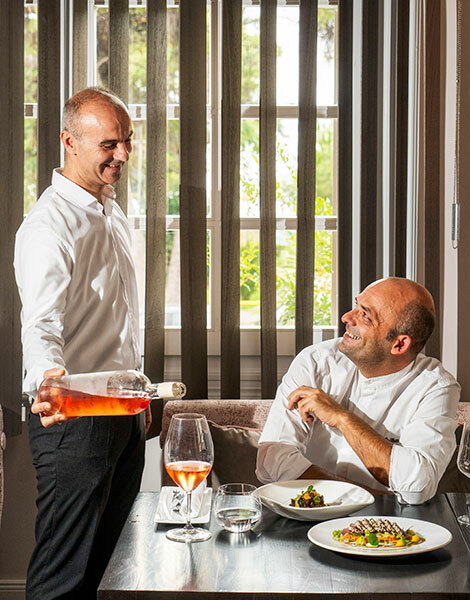 The Aficionados (105 Nikolaou Plastira) occupies a historic art deco-style villa, the ideal setting for indulgent dishes such as lobster bruschetta, sea bass carpaccio and Black Angus beef tartare. With a reputation for consistent quality, Mavri Thalassa (3 Nikolaou Plastira) is a great favorite for special nights out. 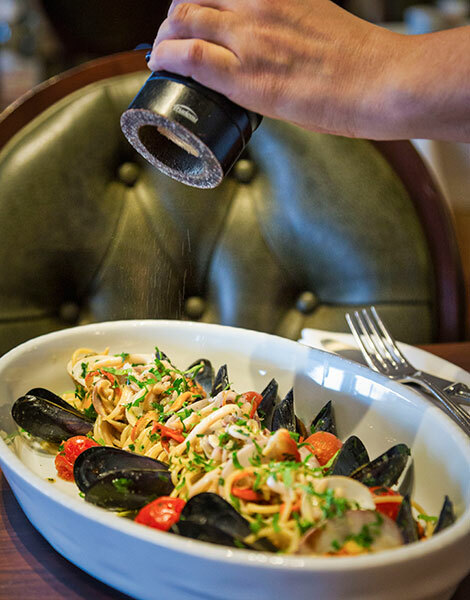 The freshest of seafood is prepared with simplicity and care, and there’s a fine wine list, too. If you feel up to it, it’s worth exploring the nightlife of Valaoritou Street, the surrounding alleys and the historic neighborhood of Frangomachalas. 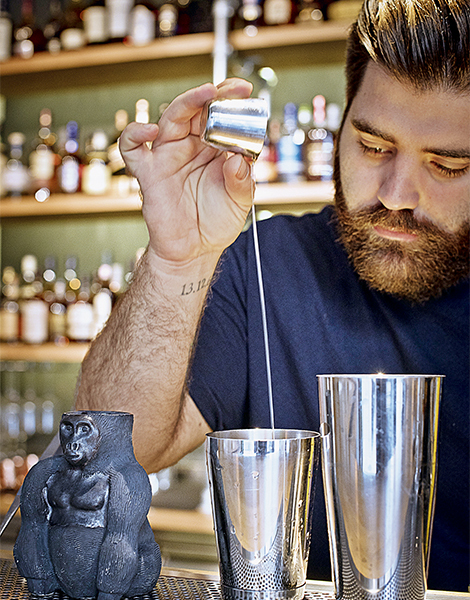 For unusual cocktails, choose Gorilla (3 Verias). 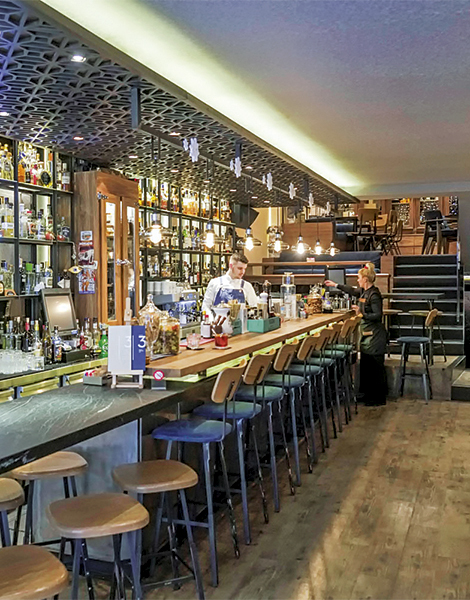 For a smoke-free environment and a great selection of spirits, including rare whiskeys and rums, head towards the seafront and the bar Vogatsikou 3 – its name is also its address. Both bars are among the hippest watering holes in the city. Cheers! The north of Greece is famous for its excellent filo pastries, and queen among them is the bougatsa – layers of flaky dough with fillings of cream, spinach, cheese, or seasoned chopped meat, hacked into bite-sized pieces. 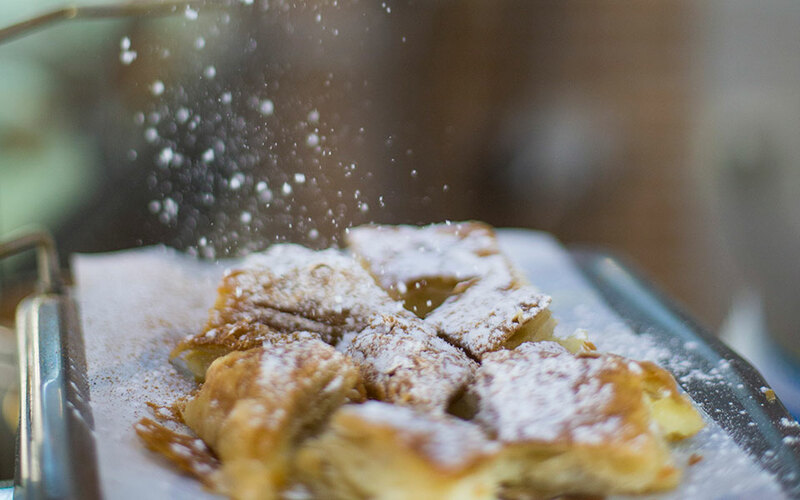 Very few artisans still turn out bougatsa with hand-stretched dough, but Bantis (33 Panagias Faneromenis) is one of them. Also try Anoteron (61 Aghiou Dimitriou), known for top-quality ingredients, or To Neon (20 Frangon & Leontos Sofou), which also specializes in handmade pies. A Roman mausoleum or temple similar in design to the Pantheon in Rome, later consecrated as a Christian basilica, then converted into a mosque, before being re-dedicated as a Greek Orthodox church, the Rotunda is an amazing monument that bears living testimony to the city’s complex past; it also provides an ideal starting point for your sightseeing tour. To stand in the restored interior beneath the enormous (30m high) dome is a mystical experience. 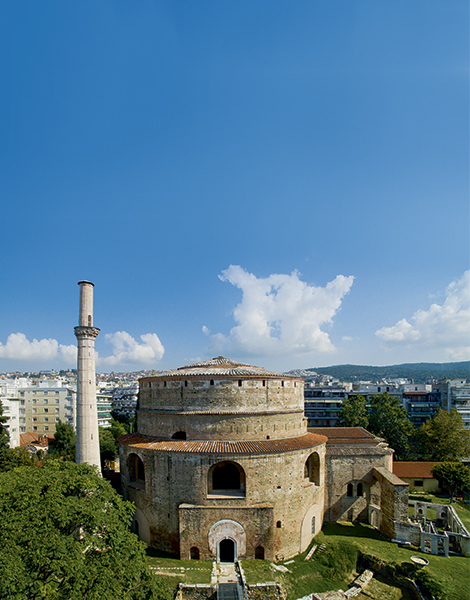 Trivia: the minaret, a remnant of the Ottoman period, is the only one to have survived in Thessaloniki. After your visit here, make your way up to Kassandrou Street where, at number 91-93, surrounded by drab apartment buildings, stands the Alaca Imaret (lit. “multi-colored hospice”), a mosque built in 1484 which is now used as a municipal cultural venue. The face of its minaret was once decorated with colorful, lozenge-shaped stones and, on the walls of the mosque, you can still see inscriptions with quotes from the Koran. Nearby (150m) is the Church of Aghios Dimitrios, the patron saint of Thessaloniki, with its underground bathhouse (which later became a crypt) where Dimitrios was martyred and buried. Close by, as you head towards Olimpou Street along sidewalks flanked by apartment blocks, small fashionable coffee shops and attractive arts and crafts stores, you’ll come to the site of the Roman Agora (2nd c.) with its restored Odeon. Here, don’t just remain on the surface: the reconstructed Cryptoporticus, a covered passageway stretching for 138m, leads to an underground museum with exhibits covering 17 centuries of history. Leaving behind the quiet of the museum, about 300m east of the Roman Agora, you will be greeted by music from a gramophone and the characteristic smell of old wood at the Bit Bazaar, the bustling flea market operating since 1928 and still alive thanks to the efforts of the latest generation of dealers and traders. At the approximately 50 small shops, bric-a-brac hunters will find themselves in seventh heaven, although “serious” antique collectors may be disappointed. Unpretentious but still refined, these two places offer a fresh approach to modern Thessalonian cuisine. Nea Folia (4 Aristomenous) is a longtime favorite of the locals; in a light-filled semi-basement, you can enjoy complex, beautifully plated dishes served at tables covered with butcher paper. Forty different artisan cheeses from all over Greece are featured on the menu. Warm and inviting Sebrico (2 Frangon) serves up some very attractive dishes, including grilled octopus atop white fish-roe dip, and fresh sardines wrapped in vine leaves – both delicious. The prices are very reasonable, and both of these restaurants will bring you a little something sweet on the house. More excellent seafood is served at the modern dining room of Marea Sea Spirit (13 Margariti Lori) is the perfect place for crayfish tartare and sea bass in a salt crust, and, if you prefer a classic neighborhood atmosphere, Ouzeri Kosmas (15 Platonos) is frequented by regulars who come for the fish which is grilled or fried to simple perfection and accompanied by boiled greens, taramosalata (fish roe dip) and a glass or more of ouzo or tsipouro. Thessaloniki owes its identity to the sea. Few cities can claim to have such an exciting seafront. We suggest you start your walk from the port’s Pier A, where old warehouses have been converted into modern cultural venues, including the Thessaloniki Cinema Museum, the Thessaloniki Center of Contemporary Art and the Thessaloniki Museum of Photography. If it’s a nice day, the area outside is great for relaxing by the sea or for sipping a coffee at Kitchen Bar, the popular all-day hangout. 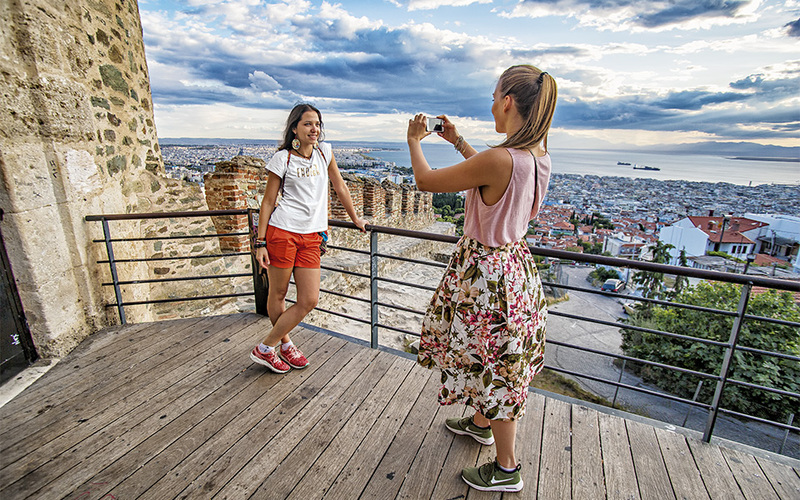 Strolling south along the waterfront on Nikis for about 20 minutes, you’ll come to the iconic White Tower, which hosts a multimedia exhibition on the city’s history in its museum and boasts an incredible view of the Thermaic Gulf from its viewing platform, 34m above ground level. From here begins the most beautiful seafront stretch, the Nea Paralia (New Waterfront). Its redevelopment, completed in 2013, endowed the city with a 3.5k-long recreation zone that features countless places for relaxing and taking in the sea view (as far as Mt Olympus) or for people-watching. Stroll down the wooden boardwalk before resting awhile on one of the brand new 3D-printed eco-friendly benches that double as planters. Here, everyone finds an opportunity to take some time out. 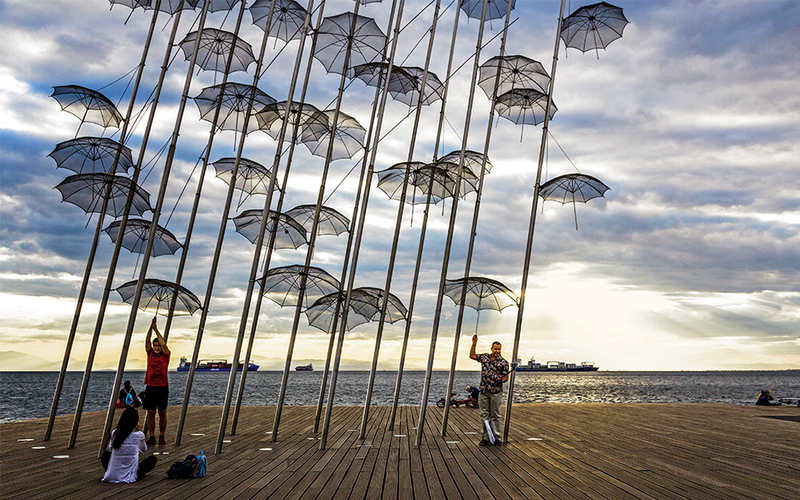 A selfie in front of the renowned “Umbrellas” sculpture, a work by George Zongolopoulos, is a must. The hour-long walk is made even more enjoyable by snacking on those sunflower or pumpkin seeds you bought earlier, just like the locals. And don’t forget, you can do this route on a bicycle, too (go to thessbike.gr for information on Thessaloniki’s bike-sharing system). The old warehouses along the cobblestone streets in this lively neighborhood have been converted into restaurants and bars decorated in various styles, from the traditional to the exotic. The mood of historic Thessaloniki lives on in the classic interior at Zythos (5 Katouni), which serves a fine selection of beers and wines and classic Mediterranean dishes. 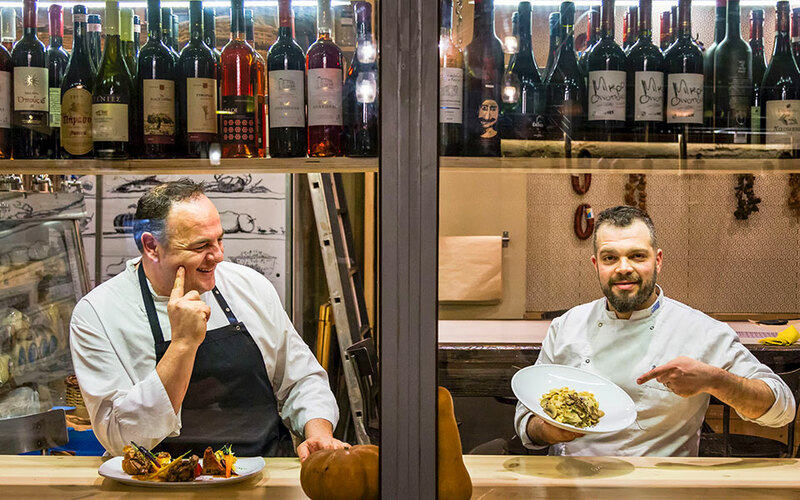 Or try the authentic Cretan specialties at Charoupi (4 Doxis), which features the best selection of Cretan wines in the city, and great value-for-money food. 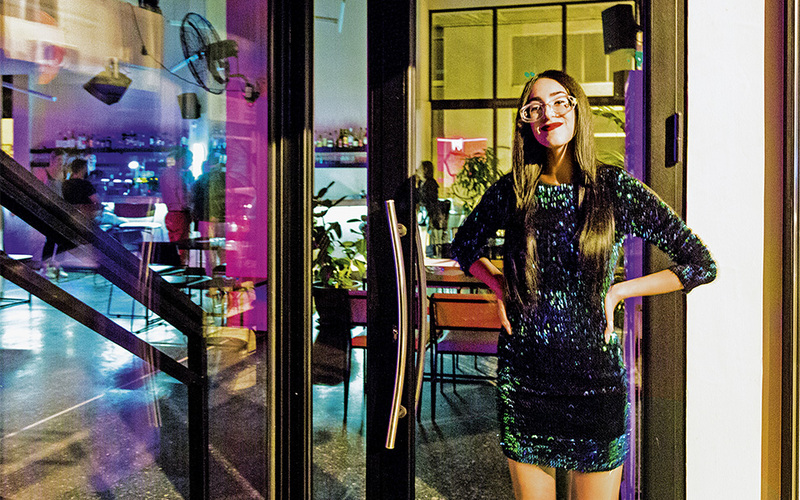 You’re never overdressed for Thessaloniki’s famous nightlife. Whatever your taste is, you’re in for a great night and you’re spoilt for choice. A long night of dancing at Uberdooze (8 Danaidon), known for its great themed parties, and international guest DJs in an industrial space, is always a good idea. Alternatively, experience Thessaloniki rebetika, what some call the “Greek blues,” at Rossiniol (21 Athinas). The classic choice for a bite on the way home is souvlaki. Derlikatessen (7 Ioanni Kouskoura) serves some of the best, even for vegetarians. 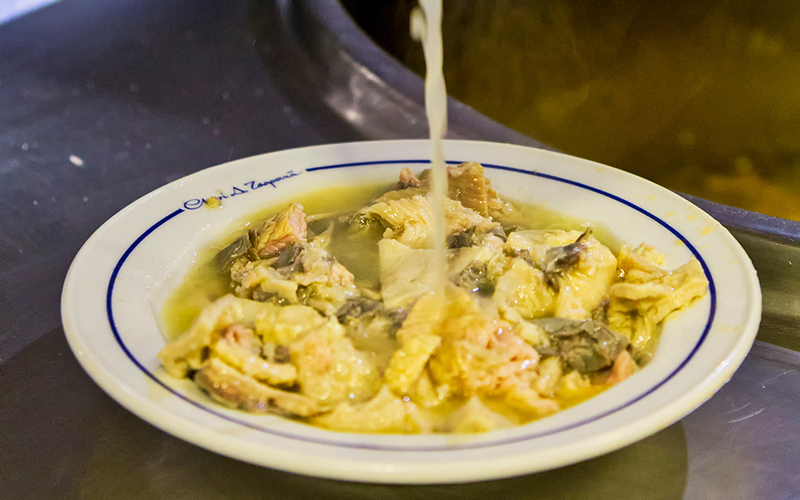 If you’ve been listening to rebetika, though, the classic follow-up is a bowl of patsas at Tsarouchas (78 Olympou); this veal soup of tripe and trotters is famous for fending off a hangover. The city has gone all in on the worldwide brunch trend. For traditional Greek recipes with a twist, visit industrial chic Ergon Agora (42 Pavlou Mela). You can also pick up some gourmet souvenirs from their store. Mahalo (5 Verias) started life as a gourmet street-food truck and now serves up inventive dishes in its homey space in the upcoming neighborhood of Ano Ladadika. 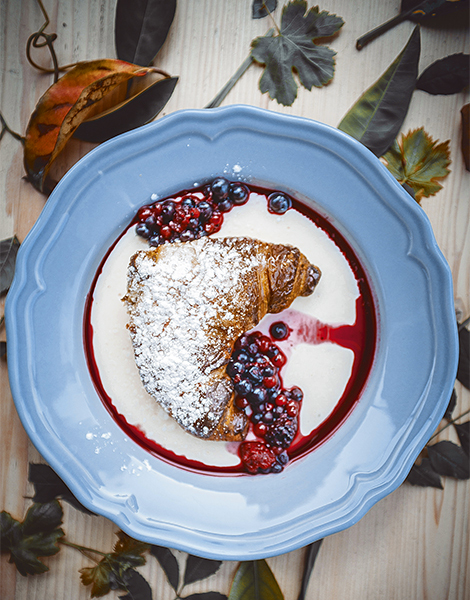 It’s worth waiting for a seat at Estrella (48 Pavlou Mela) to try their red velvet pancakes or the famed “Bougatsan” ( a mash-up of a croissant and a traditional bougatsa pastry). Close to the White Tower, Canteen (7 Dimitriou Gounari) is a popular meeting point, serving a menu of well-executed classic brunch dishes. 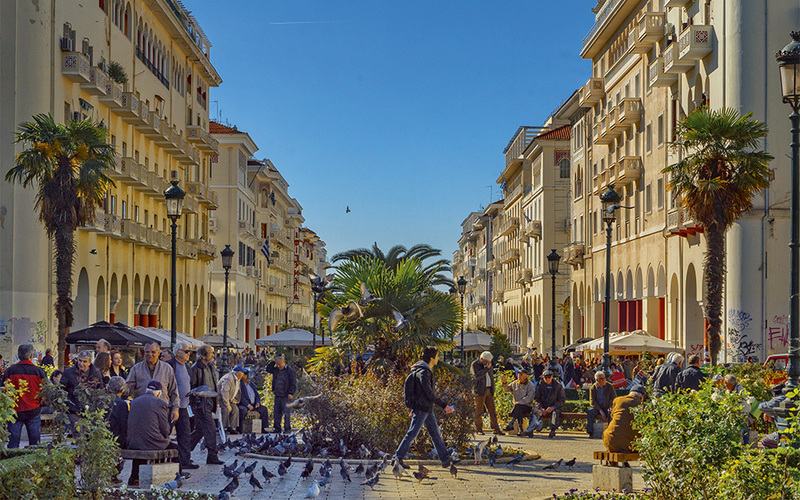 Thessaloniki boasts a fascinating museum neighborhood, where centuries are only minutes apart. A convenient starting point is the award-winning Museum of Byzantine Culture (2 Stratou), housed in an architecturally impressive building designed by Kyriakos Krokos, where you’ll find all kinds of objects on display: from early Christian architectural and mosaic fragments and a stepped marble pulpit from the city’s first churches, to sculptures, pottery, farming implements, jewelry, icons and ecclesiastical prints, plates, embroidery, books and silver and gold objects. Ask for a tour (included in the admission price) and round off your visit in the lovely courtyard of the great “B”café-restaurant. Next stop, less than half a kilometer north, is the beautifully minimalist Archaeological Museum of Thessaloniki (6 Manoli Andronikou), where you’ll find excellent thematic displays that cover prehistoric times, ancient daily life, the rise of cities, religious worship and funerary customs. 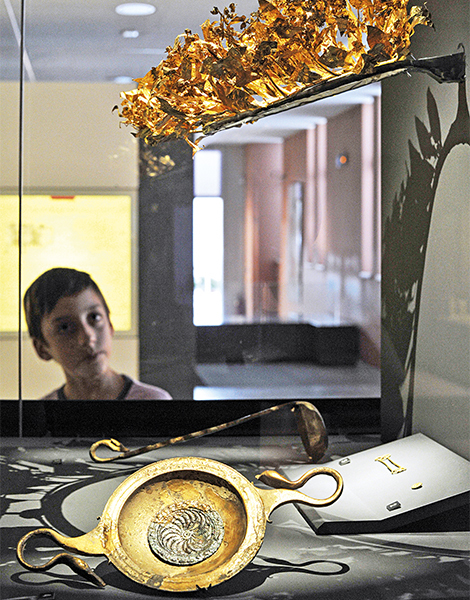 Mosaics, sculptures, golden artifacts and the seemingly solid gold Derveni Vase are just some of the highlights. 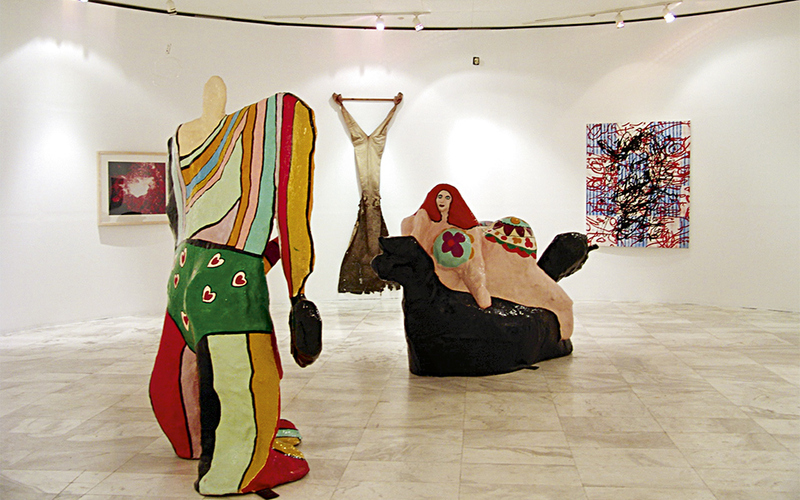 For your contemporary art fix, the collections of the Macedonian Museum of Contemporary Art (154 Egnatia) contain more than 1,800 paintings, sculptures and works of video art by Greek and foreign artists. 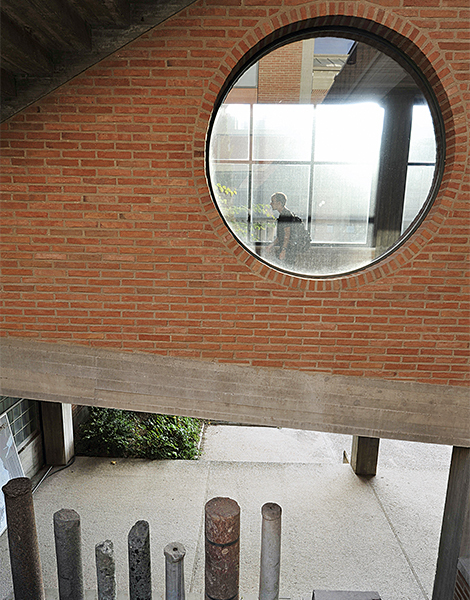 At present, the museum is one of the main venues for the 6th Thessaloniki Biennale of Contemporary Art. 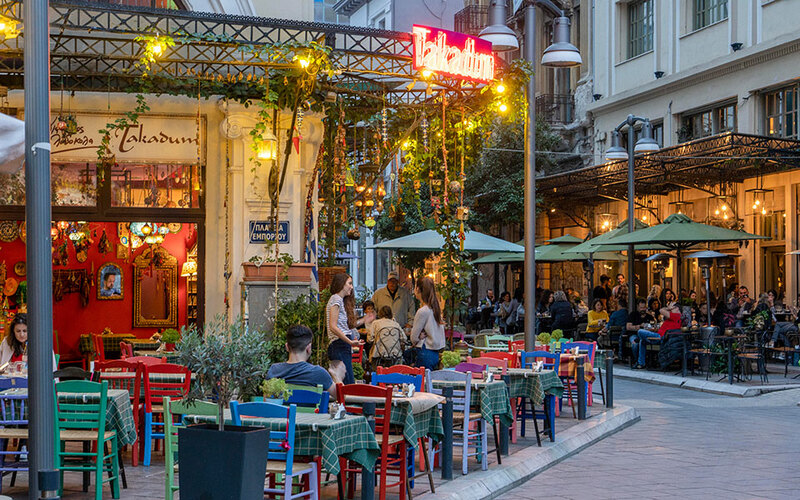 For a perfect ending to your Thessaloniki city break, we saved arguably the loveliest, most authentic part of town. Only a 15-minute walk from Aristotelous Square, the Ano Poli (Upper Town) is arguably the most authentic and colorful part of the city. Situated just inside the Byzantine walls, high above the main town, it escaped the devastating fire of 1917. It’s a beguiling maze of steep tree-lined alleys, small squares, and stairways, lined with charming examples of Ottoman architecture, fountains, and traditional tavernas and cafés. Near the eastern walls, make a stop at one of Ano Poli’s early Christian sites included in the UNESCO World Heritage List, the beautiful Aghios Nikolaos Orfanos church (1 Irodotou). Before you leave, pay a visit to the Trigonio Tower, where you will have a sweeping view of the city and bay. See three famous Thessaloniki landmarks from a different angle.